When I bought the Land Rover, the gear lever was extremely sloppy in 5th and reverse. Sometimes it was hard even to engage reverse as pushing the lever to the right would almost push it into my leg. Getting into 5th coming down the slip road onto the motorway was a hit and miss affair. So I pulled it apart! It ended up being quite a quick job taking about an hour at the most and made a world of difference to the gear changes. I removed the rubber and foam from around the gearbox tunnel and undid the 15mm nyloc nut on the base of the gear lever. The smaller rubber boot around the bias springs was quite tricky to get off. Undo the four nuts at the base of the housing and lift it all away. What I found was a real mess. The plastic selector seat bush that the lower ball sits into had disintegrated into a gooey mess on the inside of the housing. Effectively the ball wasn't held tight in the bush. I undid the grub screw with a 5mm hex bit and removed the selector shaft. The selector shaft has a circlip on the bottom that holds the selector bush on. Undo this and it will easily slide out. There is marked difference between the old and new bushes. The new one will hold the ball much tighter. Here are the parts together. Everything just simply goes back together the way it came off. The grub screw and the selector housing bolts should be tightened to 25NM. I thought I'd change the gearbox oil at the same time with MTF-94, as gear changes would get a bit crunchy when up to temperature - a symptom of old oil or using ATF in an R380. 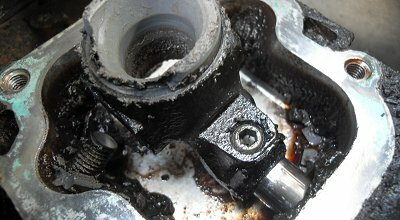 A T55 torx bit is required to undo the filler plug and a 32mm spanner to undo the drain plug. A cut up 4 pint milk carton wedged itself in nicely between the gearbox and crossmember. The process is very similar to changing the oil on an LT77 and the drain plug washers are the same. I didn't get a very nice surprise when I looked at the drain plug.... Turns out it had chunk of an inner synchro hub attached to it....! The synchro hub helps mesh the gears together during gear changes by matching the spinning speeds of the gearbox shafts connected to the engine and wheels. A synchro hub is shared between first and second, third and fourth and fifth and reverse. I suspect it is the 1st/2nd one that this piece is from, as I invariably have trouble getting into either of those gears from time to time. The remnants of the old oil showed a glittering display of metallic shards as though i'd been panning for gold. Quite a lot of it is brass from the baulk rings, part of the synchro assembly along with the synchro hubs. I'm hoping the gearbox will be alright for the moment, but so far as an expedition goes this would definitely need a new one before any major overland undertaking. The physical sight of seeing a piece of gearbox fall out the bottom does not inspire much confidence. I've made peace with myself that because it's the synchro hubs that are damaged, it's gear changes that might make things worse. I presume that they are not under any stress whilst in gear and driving. Until I find the best part of a grand and enough spare time, I think every gear change is going to be a heart in mouth affair! Read about how I eventually replaced the gearbox when the clutch failed.